By the end of this year, police officials say, more than 100 cameras will have begun monitoring cars moving through Lower Manhattan, the beginning phase of a London-style surveillance system that would be the first in the United States. The Lower Manhattan Security Initiative, as the plan is called, will resemble London's so-called Ring of Steel, an extensive web of cameras and roadblocks designed to detect, track and deter terrorists. British officials said images captured by the cameras helped track suspects after the London subway bombings in 2005 and the car bomb plots last month. If the program is fully financed, it will include not only license plate readers but also 3,000 public and private security cameras below Canal Street, as well as a center staffed by the police and private security officers, and movable roadblocks. See our last posts on the surveillance state and fear in New York City. The thousands of new cameras that could accompany Mayor Bloomberg's congestion pricing proposal for Manhattan are worrying lawmakers and civil libertarians, who say more footage of New Yorkers going about their daily routines puts everyone's privacy at greater risk. "The Bush administration has a philosophical propensity to spy on people," Assemblyman Richard Brodsky, a Democrat of Westchester, said. 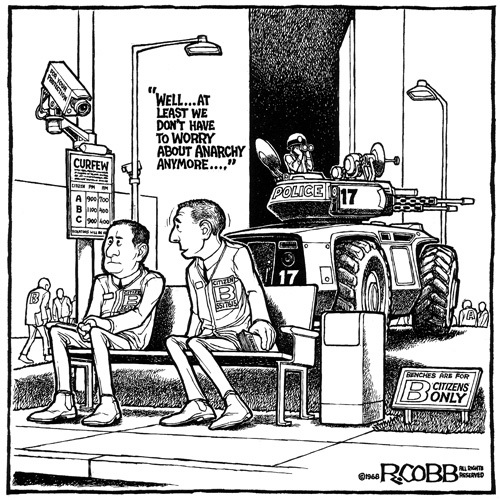 "They have no objection to the government monitoring citizens." More than 1,000 cameras would be needed to photograph the license plates of vehicles in order to charge drivers an $8 road tax for entering Manhattan below 86th Street during peak hours. Mr. Brodsky, who said he plans to grill Mr. Bloomberg on the privacy implications of congestion pricing at a hearing this morning in New York City, said the mayor's supporters would likely balk if President Bush were pushing to flood their streets with cameras. "The progressive community doesn't care because they like Mike Bloomberg," he said. The congestion pricing legislation introduced yesterday in the state Senate would not prevent a citizen from subpoenaing an image of a vehicle for use in a civil or criminal case, critics of the plan noted. "There is a sense of Big Brother, which is why the Bush folks love congestion pricing," the spokesman for the Coalition to Keep NYC Congestion-Tax Free, Walter McCaffrey, said. "If the congestion plan has to include thousands of surveillance cameras, that would raise serious and substantial civil liberties concerns," a former director of the New York Civil Liberties Union, Norman Siegel, said. The NYCLU, which received a $10,000 gift from the Bloomberg Foundation, has been silent on the privacy implications of congestion pricing. The executive director of the NYCLU did not return several phone messages yesterday. Advocates of Mr. Bloomberg's Manhattan road tax argue that 1,000 new cameras on the streets of New York could hardly damage privacy rights that New Yorkers gave up to the public realm years ago. "We're talking about cameras that are aimed at public streets," Council Member John Liu, who heads the council's transportation committee and is a supporter of the mayor's plan, said. "The reality is that there are already thousands of cameras on these very same streets." Cameras would also be needed to implement bus rapid transit lanes, which would be funded with the revenues from congestion pricing. While the fine-tuned surveillance systems would be able to zoom in on a vehicle's license plate, some city officials said they expected that the cameras would end up snapping shots of entire cars to discourage abuse of the system. In London, which implemented congestion pricing in 2003, some motorists successfully dodged the traffic tax by hanging phony license plates from the fenders of their cars.